HarperCollins has just published a paperback, ebook, and audiobook edition of Semiosis in Great Britain available today, August 9, and in Australia. The cover art, similar to the American cover art, features the leaves of a sundew plant (Drosera). The dew-like drops on the hairs of its leaves are actually a kind of glue that attracts and traps insects. Then the hairs and tentacle wrap around the victim and excrete digestive fluid. The leaves are also sometimes referred to as “tentacles.” The idea of motile, flesh-eating tentacles on plants is creepy. I’m glad sundews are small, because they grow in many areas of the Earth, including the American Midwest, where I live. The text hasn’t been adapted to British English, which disappoints me a bit. I would have enjoyed seeing the word “color” with an extra U.
Congrats! 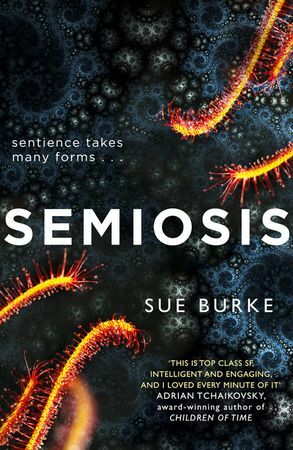 Semiosis is really worth the praise!